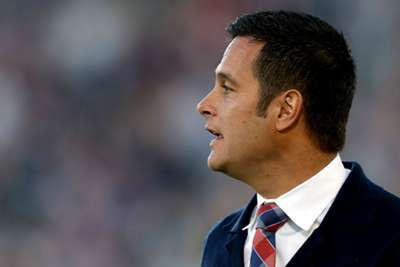 Real Salt Lake closed in on the MLS play-offs after a 4-1 thrashing of the New England Revolution on Thursday. Goals from Nick Besler, Sebastian Saucedo, Corey Baird and Damir Kreilach saw RSL end a four-match winless run. The victory consolidated their spot in sixth in the Western Conference, moving them four points clear of the LA Galaxy, who have two games left this season. The hosts made a dream start at Rio Tinto Stadium, Besler sliding in at the back post to put away a Baird cross in the fourth minute. Saucedo doubled the lead 10 minutes later from the edge of the area, before Baird found the bottom corner to make it 3-0 for Mike Petke's men. Teal Bunbury had a chance to bring New England back into the game in the 35th minute, but Nick Rimando made a strong one-handed save to deny the forward from the penalty spot. RSL added a fourth through Kreilach five minutes into the second half and they saw out a convincing win despite Kelyn Rowe's 69th-minute header for the visitors. New England are already out of the play-off race and sit eighth in the Eastern Conference.